Eden Hazard says he would have "no problem" with staying at Chelsea for the remainder of his career. Speculation has intensified surrounding a possible Real Madrid bid for Hazard, and the player himself has admitted that he might be interested in such a move. However, having made a superb start to the season under new Chelsea boss Maurizio Sarri, Hazard told Sky Sports that he could remain with the Blues until he retires. 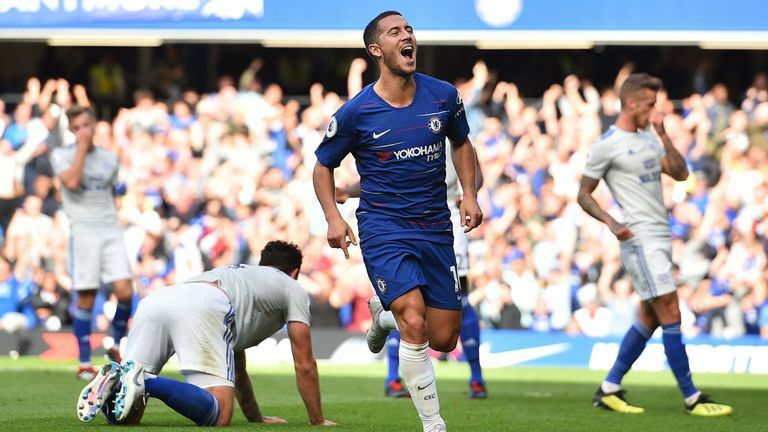 "I can finish with Chelsea," the Premier League's top scorer told Renault Match Zone, which will be shown on Sky Sports Premier League at 5pm on Friday. "So If I don't go to Spain, it is not a problem. I love the fans - I think the fans love me! What happens in the future, I will be happy, so that's it." Hazard helped Belgium to the semi-finals of the World Cup in the summer and has scored seven Premier League goals this season, for a Chelsea side who remain unbeaten in all competitions.